The E-Z Boot Orthotic System controls or prevents lower extremity contracture and deformity associated with immobility and trauma. 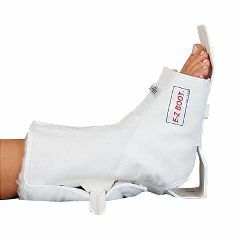 This lightweight, durable plastic splint with soft fleece liner supports the foot, correctly positions the lower extremity and eliminates pressure. Squared-off, nonskid heel for increased stability; removable snap-in bar to prevent rotation. Not recommended for weight-bearing use. Comes with instructions, plus one-piece machine-washable white E-Z Liner and laundry bag. Latex free. For the price, it should come with an extra liner to use when the other ones are being washed. Ordered EZ boot. Can product be returned if still in plastic?